Ok, can I say something before we get into explaining the deliciousness pictured here? But often what I cook isn’t, well, a completely “authentic” recipe. Sometimes I take shortcuts (like using a seasoning packet). Sometimes I recreate a restaurant recipe. Sometimes I take a beloved regional sandwich and turn it into a delicious, cheesy mess. 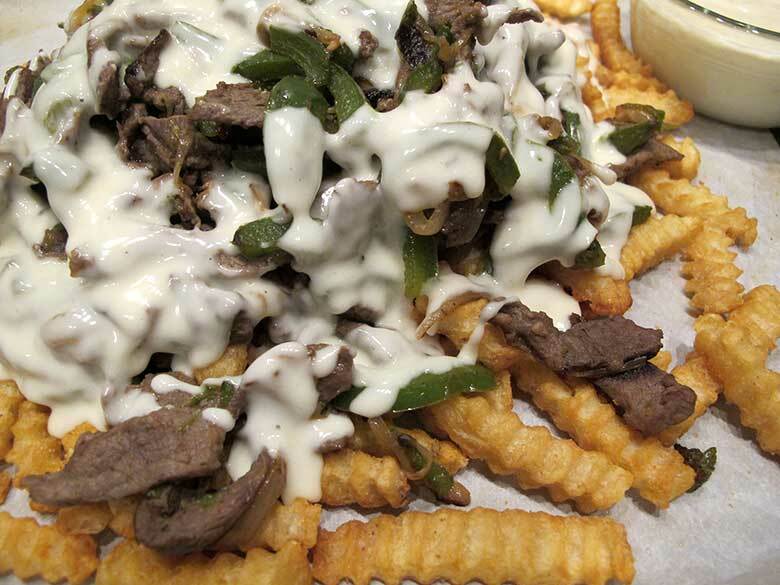 And that’s what these Philly Cheesesteak Fries are. Finger food only for the brave. Pile a portion onto a plate and eat with a fork for the more dainty of us. And they’d probably cause a Philadelphian to melt in shame at my audacity. I don’t know why I wanted to combine cheesesteak and cheese fries into one, but I have to say, I’m really happy I did. I’m also pretty certain if you add these to your Super Bowl feast, there’s going to be some others who are really happy about it, too. Oh, and a note on the fries: You really want to use the Ore-Ida Extra Crispy Golden Crinkles. Crinkle Cut is essential for catching all the cheesy goodness and these particular fries are much heartier than other brands I’ve tried. Place steak in freezer for about 45 minutes. Once firm, slice into thin 1/8″ strips, the thinner the better, really. Coat in 1 tablespoon oil and set aside. Cook fries per package instructions; keep warm. Once bubbling has subsided add flour and cook for 1-2 minutes until light brown. Slowly add warm milk to butter-flour mixture, stirring constantly. Cook 4-5 minutes until thickened. Remove from heat and slowly mix in cubed cheese until melted. Cover and cook on the lowest heat possible until it fully incorporates, stirring periodically. Keep warm. Preheat large saute pan over high heat. Add meat to pan and cook, over high heat, until no longer red. Return pan to heat, add additional oil (if necessary), and add the peppers and onions. Cook, stirring often, until peppers are softened and onions are browned. Return meat to pan, stirring into the pepper and onion mixture. Cook until meat, peppers, & onions are caramelized. Remove from heat. Place cooked fries on a platter or sheet pan (see note). Scoop meat mixture over fries. Pour half of cheese sauce over fries and meat. Since the meat and vegetables are cooked over high heat, I recommend having everything prepped and ready to go before you heat your saute pan. This will reduce the chances of accidentally overcooking any of the components. I prefer ribeye steak, but you could substitute sirloin, top round, or even ground beef for the ribeye. I cook the fries on a parchment paper-lined sheet pan and serve the whole thing directly from the pan. Oh, yeah! Fat and carbs are the best hangover cure! For the cheese sauce. Do I use Parmesan cheese in the container or the shreeded cheese in a bag one ? I used a wedge and shredded it myself. If you’re using pre-packaged, I’d recommend the bagged stuff. I think the container cheese would be delicious, but probably make the sauce gritty. Do I warm the milk up and if so for how long ? Technically you don’t have to, it will just take longer for the sauce to thicken if you use cold milk. I usually put the milk in a small saucepan on low while I cut and prep the steak and peppers, then the milk is warm when I go to make the sauce, but shouldn’t be boiling over. On low, I’d estimate it should warm through in about 8-10 minutes. If you have it on medium and are watching it should only be 4-5 minutes.